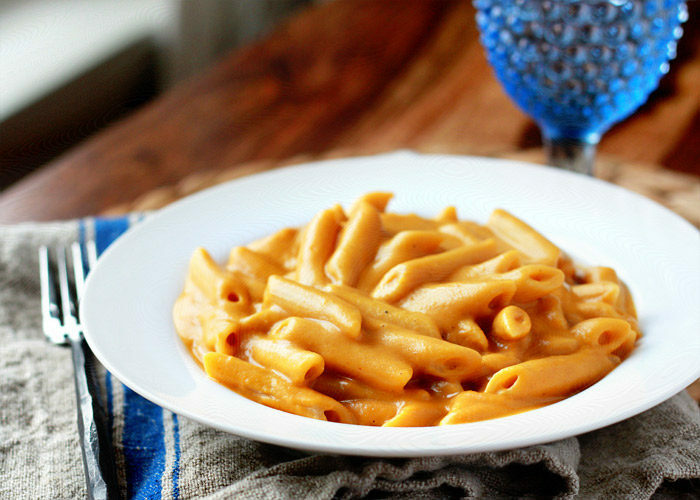 Super Creamy Vegan Stovetop Mac & "Cheese"
Vegan comfort food at its finest, this easy vegan mac and cheese is made with sweet potatoes, butternut squash, and other mainstream real-food ingredients. No weird stuff here – just pure macaroni and cheese-like deliciousness! I love this recipe. And I’m way, way too excited about it. Tender pasta. Drenched in a smoky, creamy, goldenrod sauce that makes its way into every nook, cranny, and tunnel of pasta. Sounds a lot like mac & cheese, doesn’t it?! And it looks like it, too. But it’s not! Because there’s no cheese! Or milk, for that matter. This Vegan Stovetop Mac & Cheese is made with sweet potatoes, butternut squash, coconut milk, and a few other veggies, spices, and dashes of this and that until it achieves creamy stovetop mac & cheese perfection. All sans dairy. Oh, and at just under 400 calories per serving! This vegan macaroni and cheese recipe came about for a few reasons. As I’ve alluded to here and there lately, I’ve been making some dietary changes lately, the most notable being I’ve eliminated dairy. Which also seems to have almost completely eradicated some weird health problems (namely, heart palpitations) that I’d been having. Physically, I feel much better without dairy. Mentally, well. I miss it quite a bit. See #2. I love, love, love macaroni and cheese. It’s been my favorite foodstuff since as long as I can remember. This mac and cheese recipe is, in fact, far and away the most popular I’ve shared on Kitchen Treaty. Not that I ate it constantly, but, dang. I miss the stuff. 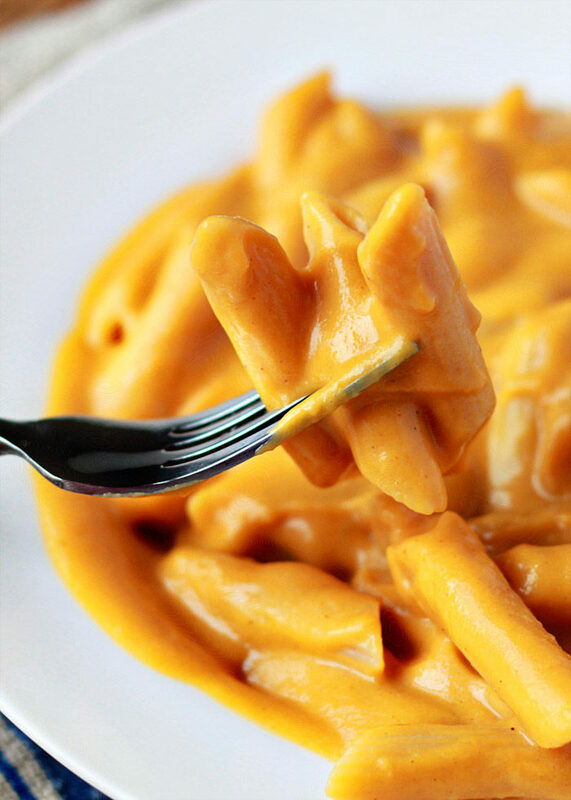 I recently learned that butternut squash is the best thing to add to mac & cheese since, well, cheese (Exhibit A). But, as much as I love the recipe linked in Exhibit A, I have some guilt over just how fattening it is. It’s, like, pretty dang fattening. So I sought to make a lighter version. 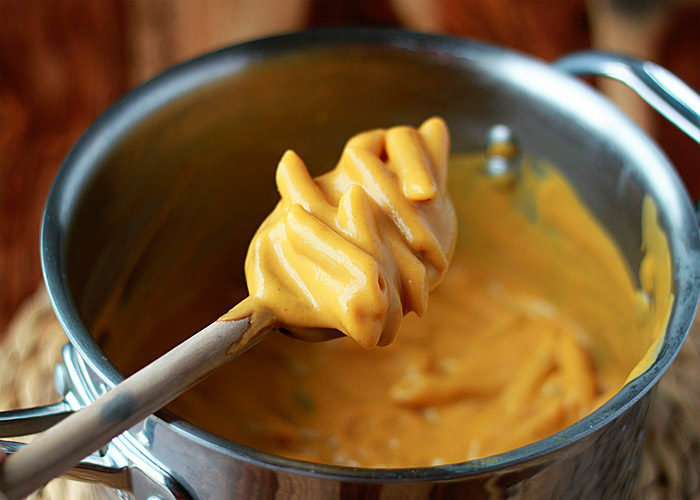 This Sweet Potato Nacho Cheese. I tried it and I loved it and I kept thinking of everything I should try it in, mac & cheese included. This recipe ended up being a far cry from the original sweet potato nacho cheese, but it definitely inspired my use of sweet potato in this recipe. So! We’ve got butternut squash and sweet potatoes. Then we saute up some onion and garlic. Smoked paprika and dry mustard make an appearance, plus a little veggie broth to keep things light (and add flavor). We puree it all with some coconut milk, soy sauce, and a few other flavor-enhancers. And that’s the uber creamy dreamy sauce! Know another thing that’s cool about this recipe? 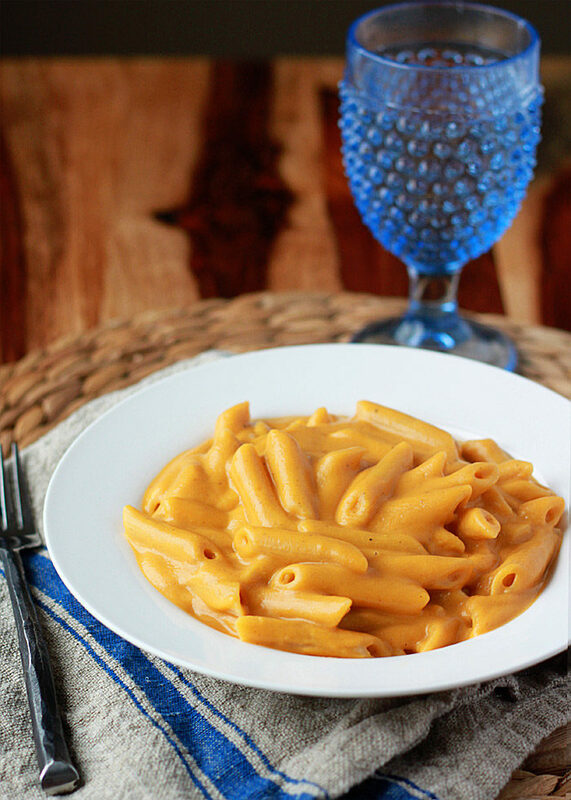 This is a vegan macaroni and cheese recipe without nutritional yeast. I know many – okay, most – vegan “cheese” recipes call for nutritional yeast – it adds an uncanny “cheesy” flavor (not to mention vitamin B12), after all. I tried it in this recipe, and I did like it. But I wanted to make this a recipe that feels accessible to everyone. I’d like to think I’m fairly adventurous in the kitchen, and I only just last month convinced myself to try nutritional yeast (affectionately known as “nooch,” which sounds worse than “nutritional yeast” in my book). I just thought it sounded weird. And gross. And weird. (By the way – I’ve since decided I love the stuff). And if you want to add it nutritional yeast, you should! But ultimately, I just decided it really wasn’t necessary in this recipe. For the photos here, I used white pasta. But whole wheat pasta (particularly penne) is also great. And I’d imagine that rice pasta would also be pretty swell, if you desire. Creamy, dreamy, easy stovetop mac & cheese without the cheese. I’m completely in love, and I would like for it to be my Valentine. Fill a large pot 2/3 full with water and place over high heat. Once boiling, add a few generous pinches of salt and add the pasta. Cook according to the time on the package until al dente. Drain and return to pan (off heat). Set aside. While the pasta is cooking, fill another large pot 2/3 full with water and place over high heat. Add the squash and sweet potatoes. Bring to a boil and cook until the veggies are fork-tender, 7-8 minutes. Drain and add to the pitcher of a heat-proof, high-powered blender (I use a Vitamix). ** Set aside. Place a medium saute pan over medium heat. When hot, add the olive oil. Add the onion and cook until soft, about 5 minutes. Add the garlic and cook, stirring, for another minute. Add the dry mustard, smoked paprika, salt, and pepper. Stir. Remove from heat. Pour in the vegetable broth and stir to release any of the browned bits of onion and spices. Pour into blender pitcher. Add coconut milk and 1 teaspoon soy sauce. Puree until completely smooth. Taste and add additional soy sauce, a teaspoon at a time, to taste, along with more salt and pepper if desired. Pour sauce over cooked pasta in the pan. This recipe makes a lot of sauce (because I like it saucy!) so you might not want to use it all. Stir gently with a wooden spoon until all of the pasta is coated. Serve. If you would like to add nutritional yeast to the sauce, I found 2 tablespoons to be a good amount. Just add it with the coconut milk and soy sauce and blend. **If you don’t have a high-powered blender, you can place all of the sauce ingredients in a large pan and puree with an immersion blender. this is mind blowing…I can’t believe that creamy mac & ‘cheese’ doesn’t have any cheese in it!! Thanks, Sue! I love that it can feel so decadent but it’s also super healthy (at least, for a pasta dish)! This looks AMAZING, just look at it. I’m drooling already. 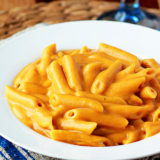 I’m a vegetarian at I’m working towards becoming vegan and my favourite dish ever is mac n’ cheese so I was really worried about finding a vegan version but this looks amazing. I’m going to have to try this. I’m in the same boat – eating more and more straight-up vegan all the time. I’m finding it to be a much harder transition than when I gave up meat so many years ago, though! I hope you love this version of mac & cheese! This looks delicious. I am not a vegan, but these Mac & Cheese will be on my table for lunch today! This looks amazing! Really clever. Do you think I can substitute butter squash with another thing? Thanks! You could try just using more sweet potato, though I haven’t tried that myself. I think it would still taste great! that looks sooooo yummy!!!!! I want to try! I just have one question, we don’t really have dry mustard here… well at least I never saw it, do you think I can use proper muster instead? I was wondering if it was not going to be stronger that way? well, thank you so much for that recipe! I think Dijon mustard (same amount, perhaps even a tiny bit more) would make a fine swap. 🙂 Hope you love it as much as we do! If I were not iced in under 4″ of sleet right now, I’d be running to the store for a sweet potato and making this tonight! I am about to cross my 3rd year mark of veganism, and cheese was (and still is) the hardest thing to get over. I made my transition from vegetarian to vegan “cold turkey” and think it helped me with a lot of cravings, but cheese is the one thing that still haunts me. I hope this recipe scratches that itch! It looks like it just might do the trick! Thank you! It was soooooo good! thank you so much! it’s gonna be one of my favorite food! This was delicious! Definitely the best homemade vegan cheese sauce I’ve made. It did make a ton of cheese so I saved half of it and made cheesy broccoli and rice with it. Yums. This was amazing! We doubled the recipe and then added a little shredded cheese because well, we’re just vegetarian and love us some cheese. Do you have any suggestions for making the sauce a little creamier? Once we mixed it all together it got a little pasty. Really delicious, just not quite the same great mac n’ cheese texture. I am not vega however we are dairy free and have been looking for a mac & cheese recipe for a bit now. All I have to say is we fell in love with this recipe! Made it last week and doing it again tonight! Great for this time of the year with all the wonderful Ontario squashes available right now! This looks amazing! As a cheese-loving vegetarian of 9 years, this looks like the perfect thing to help my transition to veganism. Quick question: would this work as a baked mac and cheese if I popped it in the oven at the end? I made your recipe tonight. It was absolutely delicious!!! Your recipe will be going into my permanent file to enjoy time and time again. Thank you!!! Looks amazing! Can I replace the butternut squash with something else? You could try more sweet potatoes? I’ve not tried that though, but if you so, please be sure to report back! So I always get them mixed up. I like to use garnet yams.. some folks call them sweet potatoes but I guess technically they aren’t… but the yam sweet potato name thing always messes me up. Your recipe calls for sweet potatoes. So.. I should look for the yellow/white fleshed sweet potatoes and not a yam right? OMG this stuff is so good, I’m eating out of the blender with a spoon while I wait for the pasta to cook. I’ll definitely add a little “nooch” next time, didn’t have any today. I don’t know if the kids will like it, but I’m in heaven! YUMOOLSKI!!!! So, I’ve tried various vegan dishes over the years and have almost never been disappointed. I am not vegan, not even vegetarian but I am gluten free and I was just looking for a way to use up a butternut squash. WELL!!! I think I hit the motherload in taste sensation! This recipe is amazing!!!! I have been texting pics to my family and friends and sending them links to this recipe. I made slight variations to the recipe because of what was in my pantry. I had scores of squash but no sweet potatoe. I had no smoked paprika but I did use liquid smoke (just 3-4 dashes). No dry mustard but a really nice grainy dijon. I am bringing this to work for 3 people tomorrow who do have dairy restrictions and I KNOW they too will be in LOVE!!! Thanks for creating this! I LOVE this! So glad you like it! Thanks, Denise! I have made this multiple times, and I am obsessed with it! Thank you so much for the recipe. I’ve sent this link to multiple people to try it, and every time I’m at the store I make sure I have the ingredients. Thanks again! This totally ended as a Pinterest fail for me. I wish I could show you the pic I took. It was fine but was nothing like your smooth pic. I’m sorry to hear that. Can I help troubleshoot? What kind of blender do you have? Looks delicious – Can you use almond milk in place of coconut? I made this for lunch today. Very good glad I found this recipe. Hi! This looks amazing. I have quite a few dietary restrictions, including dairy, gluten, and soy, and I’ve tried a few vegan cheese sauce recipes in the past, but to no avail :/ this, however, looks amazing and promising!! I can’t wait to try it 🙂 any idea, though, what a good substitute for soy sauce would be? Or would it be ok to just nix it entirely? Thanks!! Braggs Liquid Aminos is a great sub for soy sauce. I am vegan but don’t want too much soy so I use it in all recipes calling for soy sauce. I really love it and can’t wait to try this recipe. The Braggs LA also has a plethora of health benefits to boot and is gluten free. Most soy sauces that I have found are neither vegan or gluten free. Thanks! I really want to add nutritional info to all of my recipes – now to just find the time. 🙂 And I’m with you on the mac & cheese. We LOVE this recipe. We’re not vegan, but this fits nicely into our desire to eat healthier without sacrificing taste! My question is this: would the “cheese” sauce freeze well? This batch makes quite a bit for just two of us, and we have so many leftovers in the fridge that I’m worried it will go bad before we can finish it in time! You know, it might actually freeze okay – it’s almost like a soup ingredient-wise. I’m going to try it soon and report back! Just one thing: It doesn’t really taste cheesy to me. 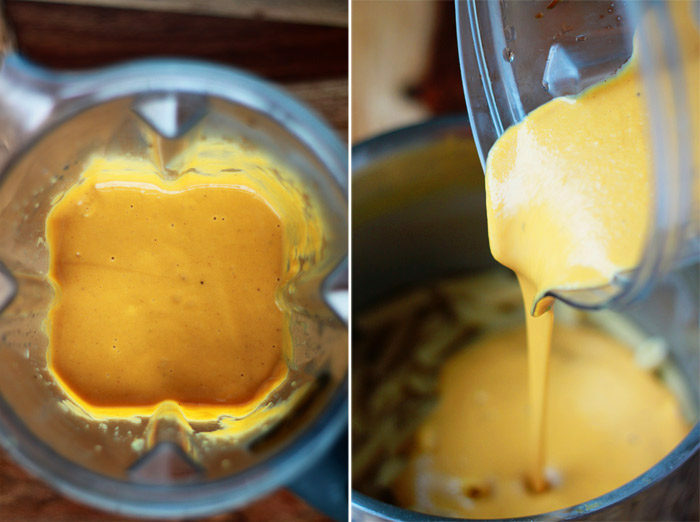 It tastes delicious, but more like a pumpkin-coconut-sauce. Do you have any idea what I did wrong? I used paprika spice, was that wrong? I am from Germany so I had to change quite a few of the measurements, maybe I made a mistake there. I also didn’t have powdered mustard, I just used regular. Have you got a tip how to make it taste more cheesy? I’ll definitely make it again nevertheless, it’s really delicious! Can’t wait to try this new recipe. It will be a change from the typical white “cheese” sauce I make for pasta. My kids will be thrilled it looks like their friends’! And along the lines of the previous post, a question about the sauce….can you are the sauce ahead of time and use in later on in the day, or do you think it will get too thick? I haven’t tried that, but I bet it would be totally fine! Good idea. 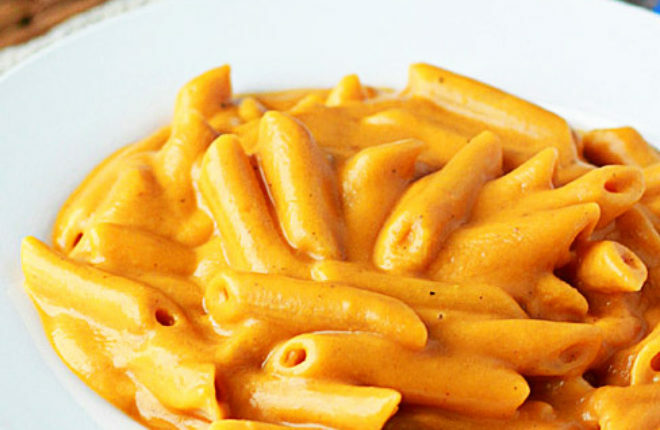 I’m a little afraid to try this–I tried another butternut squash mac & cheese and it was just awful. It tasted too much like squash, and I don’t really care for squash but I try to eat it anyway. It was just tolerable the first day, but nobody could stand to eat the leftovers. So I’m wondering, does it taste like blended up squash? I would reference the recipe to see what the difference was, but I deleted the pin. I don’t think the other one had coconut milk–maybe that helps? Hmmm … you may detect some butternut squash, yeah. Have you tried cashew based vegan mac & cheeses? I haven’t yet, but it’s on my list. You may like those better. Does it have to be coconut milk, or will any plant-based milk work? THIS LOOKS AMAZING!!! I am a huge fan of your “best mac and cheese ever” dish, and everyone I’ve made it for is OBSESSED! I’ve recently gone totally Dairy free so I am giving this a go 🙂 Thanks for sharing! Would it be okay to use coconut cream instead of just milk? That’s what I have on hand and I made this once before and I’m *hoping* *thinking* maybe the cream will help make it smoother and creamier? Hmm, I would think that might work, as long as it’s not a super sweet coconut cream? If you try it, please report back! I made this over the weekend but sadly, I didn’t like the flavour at all. It was very sweet, with the coconut milk flavour being overpowering. I used plain full-fat coconut milk (not coconut beverage or sweetened coconut milk). I tried adding the 2 tbsp of nutritional yeast, then extra tamari and ultimately tomatoes in an attempt to balance out the sweetness but to no avail. I’ve made your STOVE-TOP BUTTERNUT SQUASH MAC & CHEESE which my family really enjoyed and I was hoping this would be a similar dairy-free version. My only changes to the recipe were using roasted squash and baked sweet potato instead of boiled. Do you think that’s what made it so sweet? I found this to be quite sweet as well. I’m curious to try winter squash in place of the sweet potato – I think that may do the trick. Also, I added some apple cider vinegar and a fair amount of nutritional yeast flakes to add some more body and cheesy type flavor to this. This sauce is a the best vegan and paleo option I have come across yet and I think it will be fantastic with some small tweaks. Can I roast the squash and sweet potato instead of boiling them for a little more depth of flavor? I’m sure that would be delicious! You might need a bit more broth to loosen up the sauce so keep that in mind. Will definitely have to try. What I like is there is no nutritional yeast! I am making every effort to eat whole foods and nutritional yeast found in most vegan cheese recipes does not fit into that. After all, it is loaded with folic acid (synthetic folate), and those of us with the MTHFR mutation should avoid folic acid. I am very allergic to coconut, as are about 1/3 of the people in my family – Is there a good substitute for the coconut mil? This was a delicious recipe! I used 3 cups of pureed butternut squash instead & sub coconut aminos for the soy sauce. I also ended up adding a tbsp of nutritional yeast + additional sprinkling/topping on my individual serving. Definitely made quite a bit of sauce. According to my blenders measurements it came to 6 cups of sauce.